The Armed Forces of Ukraine are expected to become fully compliant with NATO standards. On 8 March, the NATO HQ hosted the meeting of the Alliance General Secretary, Jens Stoltenberg, and the Minister of the Armed Forces of Ukraine, Stepan Poltorak. According to the Defence Ministry press service, Poltorak also made a speech at the NATO HQ. In his speech, the minister said that the formation of new Armed Forces of Ukraine would be based on the Alliance’s basic principles. He says that the Ukrainian Armed Forces will fully comply with the subdivisions of the NATO member states. As Poltorak said, attraction of experts from NATO and other states has enabled the updated Strategy of the national security, Military doctrine and the Concept of Ukraine’s security and defence development sector. The Minister told about the final stage of developing the latest documents of the strategic importance – Strategic defence bulletin, which is to become the roadmap of reforms in the defence sector of Ukraine. The Minister also reminded of Ukraine’s goal – NATO membership. Poltorak told the Alliance representatives that illegal armed formations in Donbas violated ceasefire more than 1400 times within February 2016. At the same time, there were mostly used arms to have been withdrawn according to the Minsk agreements. The Minister expressed his hope for the important decisions on further assistance in the Ukrainian Armed Forces reformation to be made at the next session of the commission Ukraine-NATO at the highest level, which is to take place within the framework of the NATO Summit in Warsaw. 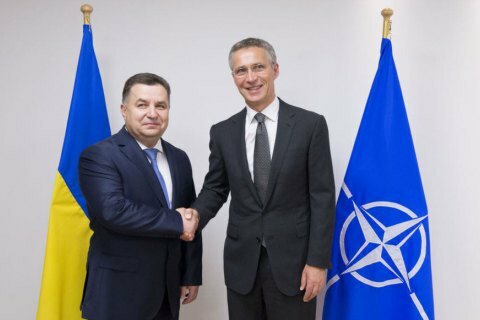 As noted before, Ukraine hopes that NATO will provide the Armed Forces of Ukraine with the complex support package at the Warsaw summit. Ukraine said not to become EU member in "next 20-25 years"